It continues to be both a challenge and a blessing to operate a faith work in these times. Our budget keeps getting smaller and smaller, our needs seem to be greater and greater, yet we continue to be able to operate by God’s wonderful grace. We thank the Lord for all He has done and continues to do to sustain us, and many of you have shared with us in it. It is quite a testimony when people ask about camp and we are able to tell them that the ministry operates with no charge to any child, that all our workers are all volunteers, and our monthly support comes from a small, but faithful, group of friends and local churches. We are currently, however, only able to meet the basic operational needs for camp. We have some specific needs where we could use a little extra help with funding to help get us through the summer camp sessions. If you would like to give toward one of these specific needs you can designate your gift by mentioning one of the following needs listed below. Many of our buildings need a new coat of paint = ??????? We are still seeking staff members to volunteer to work with the campers this summer. 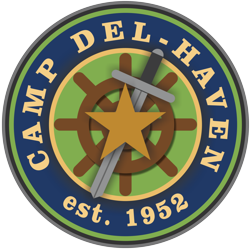 If you or someone you know (age 15 and up) may be interested in a ministry opportunity this summer, please refer to the camp website at www.campdelhaven.org, call 816-690-8465, or email sheri@campdelhaven.org. We are also available to come and speak to groups who may be interested in hearing more about opportunities for ministry. The 2016 Volunteer Applications and Camper Applications can be found by selecting the [Camp] tab at the top of the page.